In BANG! each player plays on these roles, and represents a famous Wild West inspired character. Sheriff : must eliminate all the Outlaws and the Renegade, to protect law and order. Outlaws : they would like to kill the Sheriff, but they have no scruples about eliminating each other to gain rewards! Deputies : they help and protect the Sheriff, and share his same goal, at all costs! Renegade : he wants to be the new Sheriff; his goal is to be the last character in play. Shuffle the cards and give one, face down, to each player. The Sheriff reveals himself by turning his card face up. All other players look at their role but keep it secret. Shuffle the characters and give one face up to each player. Each player now announces the name of his character and reads his ability. Each player takes another character card, from the left over cards, turns it face down to show the bullets on the back, and covers it partially with his character card to show exactly as many bullets as there are depicted on the character card. During the game, the bullets will be progressively covered, to show that the character has been injured. Put the remaining role and character cards back in the box. Shuffle the playing cards, and give each player as many cards, face down, as the bullets represented on his character card. Put the remaining playing cards face down in the middle of the table, as a draw pile. Leave room for the discard pile. Give each player a summary card. Note: for your first few games, you can try a simplified version of the game by removing all 13 special cards (the ones with the symbol of a book) before getting started. 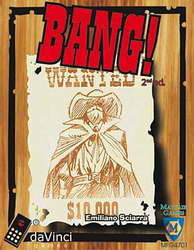 Each Western character has some special abilities, which make him unique. The series of bullets near the character's picture show how many life points the character begins with, i.e. how many times he can be hit before being eliminated from play. Example 1 : Jesse Jones has 4 life points: he can be hit four times before being eliminated from the game. Moreover, the player who is playing him can hold up to four cards in his hands at the end of his turn. In the picture, though, Jesse has already lost one life point, as the bullet-card under him is showing: three more hits and he will be out! Also, the player acting as Jesse can only hold up to three cards in his hand at the end of his turn, because is down to three life! Note: as already stated, each player represents a character; these two terms are interchangeable for the purposes of these rules. When a card is played, just follow the symbols on it: these symbols are explained in detail later on. Cards can be played only during your turn (with the exception of Beer and Missed! cards). Normally a card has an effect which is immediately resolved, and then the card is discarded. However, blue-bordered cards, like the weapon in the picture, have long-lasting effects, and are kept on the table face up in front of you. The effect of these cards ("in play"cards) lasts until they are discarded or removed somehow (e.g. through the play of a Cat Balou card), or a special event occurs (e.g. in the case of Jail or Dynamite). Once the second phase is over (you do not want to or cannot play any more cards), then you must discard from your hand any cards exceeding your hand size limit. Remember that the hand size limit of a player, at the end of his turn, is equal to the number of bullets currently shown on the card that lies under his character card. Then it is the next player's turn, in clockwise order. When a character loses his last life point, he is eliminated and his game is over, unless he immediately plays a Beer card (see below). When a player is eliminated from the game, he shows his role card and discards all the cards he has in hand and in play. a) the Sheriff is killed. If the Renegade is the only one alive, then he wins. Otherwise, the Outlaws win. b) all the Outlaws and the Renegade are killed. The Sheriff and his Deputies win. Note: if all the Outlaws are eliminated, but the Renegade is still in play, then the game continues. The Renegade must now face the Sheriff and his Deputies alone. If you play more than one game in a row, players still "alive" at the end of the game may choose to keep their character (but not the cards in hand or in play!) for the following game , players which have been eliminated must draw a new character randomly. Now that you are familiar with the rules, let's see some of the cards in detail! The distance between two players is the minimum number of places between them, counting clockwise or counter-clockwise (see figure). The distance is very important, because normally a player can reach only targets (players or cards) within a distance of 1. When a character is eliminated, he is no longer counted when evaluating the distance: some players will get "closer" when someone is eliminated. Mustang : the distance between other players and one who has a Mustang card in play is increased by 1. However, he still sees the other players at the normal distance. 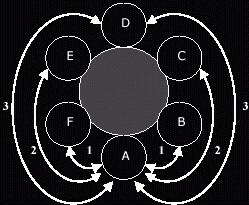 In the figure, if A has a Mustang horse in play, players B and F would see him at a distance of 2, C and E at a distance of 3, and D at a distance of 4, while A would continue seeing all the other players at the normal distance. Appaloosa : a player who has a prized Appaloosa in play sees all the other players at a distance decreased by 1. However, other players still see him at the normal distance. Distances less than 1 are considered to be 1. In the figure, if A has an Appaloosa in play, he would see B and F at a distance of 1, C and E at a distance of 1, D at a distance of 2, while A would be seen by other players at a normal distance. At the beginning of the game, each player can only hit targets at a distance of 1, i.e. only players sitting to his right or his left (it is assumed that each player has a Colt .45 revolver available, although this weapon is not represented by any cards). In order to hit targets farther than distance 1, a player needs to have a "weapon" card in play. These cards can be recognized from their blue border, black-and- white illustration and the number into the sight (see picture) that represents the maximum reachable distance. The weapon in play substitutes the Colt .45, until the card is removed somehow (e.g. through the play of a Panic! card). You can only have one weapon in play at a time: if you want to play a new weapon card when you already have one, you must discard the one you already have. Remember that when you have no weapon card in play, your character is still assumed to be holding a Colt .45 anyway. a) what the distance to that player is, and b) if your weapon is capable of reaching that distance. Example 1 : With reference to the distance figure, let us suppose that player A wants to shoot player C, i.e. A wants to play a BANG! card against C. Usually C would be at a distance of 2, therefore A would need a weapon to shoot at this distance: a Schofield, a Remington, a Rev. Carabine or a Winchester, but not a Volcanic or the ol' Colt .45. If A has an Appaloosa in play, he would be able to see C at a distance of 1, and therefore he could use any weapon to shoot at him. But if C has a Mustang in play, then the two cards would combine and A would still see C at a distance of 2. Example 2 : If D has a Mustang in play, A would see him at a distance of 4: in order to shoot D, A would need a weapon capable of reaching distance 4. A player hit by a BANG! card may immediately play a Missed! card - even though it is not his turn! - to cancel the shot. If he does not, he loses a life point (he has to register this loss by sliding his character card over a bullet). If he has no more bullets left, i.e. he loses the last life point, he is out of the game, unless he plays immediately a Beer card (see next paragraph). The BANG! card is discarded, even when cancelled. Note : players can only cancel shots aimed at them! This card lets a player regain one life point - slide the card so that one more bullet is shown. A player cannot gain more life points than his starting amount! The Beer cards cannot be used to help other players. Example 3 : A player who has 2 life points left, suffers 3 damages from a Dynamite. If he plays 2 Beer cards he will stay alive with 1 life point left (2-3+2), while he would be eliminated playing only one Beer card that would allow him to regain just 1 life point. He would still be at zero! Important note: Beer cards have no effect if there are only 2 players left in the game. Some cards show a poker card as part of their symbols. The player playing such a card must "Draw!" he has to flip over the top card of the deck, discard it, and look at the poker symbol in the lower left corner. If this card shows a symbol (and value!) that matches, then the "Draw!" was successful, and the effect of the card is resolved (the "Draw!" card is always discarded without effect). Otherwise, nothing happens: bad luck! If a specific card value or range is specified on the card, then the "Draw!" card must show a value within that range (including the pictured cards), and the suit shown. The value sequence is: 2-3-4-5-6-7-8-9-10-J-Q-K-A. Example 4. C is the target of A's BANG! C has a Barrel card in play: this card lets him "draw!" to cancel a BANG! card. So, C flips the top card of the deck and puts it on the discard pile: it's a 4 of Hearts. The use of the Barrel is successful and cancels the BANG! If the flipped card were of a different suit, then the Barrel would have had no effect, but C could have still tried to cancel the BANG! with a Missed! card. Each card shows one or more symbols that show the effect(s) of the card. Regard one life point. Only the player playing this card benefits from this effect, unless otherwise stated. Draw a cards. If "any player" is specified (see that symbol), then you can draw a random card from his hand, or you can choose one "in play" in front of him. If no player is specified, draw the top card of the deck. In any case, cards drawn are added to your hand. Force a discard a card. You can force a specified player to discard a random card from his hand, or you can choose and discard one card "in play" in front of him. It specifies that you can apply the effect to any chosen player, regardless of the distance. It indicates that the effect applies to all the other players � i.e. not the player who played the card -, regardless of the distance. This effect applies to any one player, provided that he is within a reachable distance. This means that the effect applies to any one player at a distance of 1. Mustang and Appaloosa can alter this distance, but weapons in play do not. The player with this card in play sees all other players at a distance decreased by 1 (see Appaloosa). The player with this card in play is seen by all other players at a distance increased by 1 (see Mustang). Panic!. The symbols state: "draw a card" from "a player at distance 1"
Saloon. The symbols say: "Regain one life point", and this applies to "all the other players", and on the next line: "[the player playing this card] regains one life point" The overall effect is that all players in play regain a life point. Gatling. The symbols show: "a BANG!" to "all the other players". Note: even though the Gatling shoots a BANG! to all the other players, it is not considered a BANG! card. Dynamite : the player who plays this card puts the Dynamite in front of him, face up: the Dynamite will stay there for a whole turn. When the player starts his next turn (he has Dynamite already in play), before the first phase ("draw two cards" he must "draw! ": if he draws a card showing Spades and a number between 2 and 9, the Dynamite explodes (discard it)! The player immediately loses 3 life points. Otherwise, the Dynamite is passed to the player on his left, who will "draw!" on his turn. Players keep passing the Dynamite around until it explodes (with the effect explained above) or it is removed from play by a Panic! or a Cat Balou card. If a player has both the Dynamite and a Jail card, check the Dynamite first. If a character is eliminated by a Dynamite card, his elimination is not considered to be caused by any player. Duel : the player playing this card challenges any other player (at any distance), staring him in the eyes. The challenged player may discard a BANG! card (even though it is not his turn!). If he does, the player who played the Duel card may discard a BANG! card, and so on: the first player failing to play a BANG! card loses one life point, and the duel is over. Note: you cannot use the Barrel or play Missed! cards during a duel, and the Duel is not considered a BANG! card. Note: it isnt possible to play card Missed! thru Duel, Duel is not card BANG! General store : when you play this card, turn as many cards from the deck face up as the players still playing. Starting with the player who played the card, and proceeding clockwise, each player chooses one of those cards and puts it in his hands. Indians! : each player, excluding the one who played this card, may discard a BANG! card, or lose a life point. Neither Missed! nor Barrel has effect in this case. Jail : this card is played in front of any player, who is now in Jail. A player in Jail must "draw!" before the beginning of his turn: if he draws a Heart card, then he escapes from Jail, discards the Jail card, and continues his turn as normal. Otherwise he discards the Jail and skips phase 1 and 2 of his turn, simply discarding exceeding cards. However, he remains a possible target for BANG! cards and can still play Missed! and Beer out of his turn. Jail cannot be played on the Sheriff. Volcanic : a player having this card in play may play any number of BANG! cards during his turn. This BANG! cards can be aimed at the same or different targets, but are limited to a distance of 1 (as shown by the number in the sight). Bart Cassidy (4 life points) : each time he loses a life point, he immediately draws a card from the deck. Black Jack (4 life points) : during the phase 1 of his turn, he must show the second card he draws: if it's Heart or Diamonds (just like a "draw! "), he draws one additional card (without revealing it). Calamity Janet (4 life points) : she can use BANG! cards as Missed! cards and vice versa. If she plays a Missed! card as a BANG!, she cannot play another BANG! card that turn (unless she has a Volcanic in play). El Gringo (3 life points) : each time he loses a life point due to a card played by another player, he draws a random card from the hands of that player (one card for each life point). If that player has no more cards, too bad! Note that Dynamite damages are not caused by any player. Jesse Jones (4 life points) : during phase 1 of his turn, he may choose to draw the first card from the deck, or randomly from the hand of any other player. Then he draws the second card from the deck. Jourdonnais (4 life points) : he is considered to have a Barrel card in play at all times; he can ?raw! ?when he is the target of a BANG!, and on a Heart he is missed. If he has another real Barrel card in play, he can count both of them, giving him two chances to cancel the BANG! before playing a Missed! card. Kit Carlson (3 life points) : during the phase 1 of his turn, he looks at the top three cards of the deck: he chooses 2 to draw, and puts the other one back on the top of the deck, face down. Lucky Duke (4 life points) : each time he is required to "draw! ", he flips the top two cards from the deck, and chooses the result he prefers. Discard both cards afterwards. Paul Regret (3 life points) : he is considered to have a Mustang card in play at all times; all other players must add 1 to the distance to him. If he has another real Mustang card in play, he can count both of them, increasing all distances to him by a total of 2). Pedro Ramirez (4 life points) : during the first phase of his turn, he may choose to draw the first card from the top of the discard pile or from the deck. Then, he draws the second card from the deck. Rose Doolan (4 life points) : she is considered to have an Appaloosa card in play at all times; she sees the other players at a distance decreased by 1. If she has another real Appaloosa card in play, she can count both of them, reducing her distance to all other players by a total of 2. Slab the Killer (4 life points): players trying to cancel his BANG! cards need to play 2 Missed! cards. The Barrel effect, if successfully used, only counts as one Missed!. Note: throughout these rules "he", "his", etc. are used to indicate both genders. Thanks to all the playtesters: Flaminia Brasini, Max Colamesta, Alessandro Mongelli, Edoardo Renna, Sergio Roscini, Beniamino Sidoti, to their gaming groups and to all the players, for all the precious suggestions. The author would personally thank all the members of the Chess Club "Luigi Valentini" in Civitavecchia, for their constant support and enthusiasm. BANG!© 2002-2006 daVinci Editrice S.r.l., Via T.Tittoni,3, I-06131 Perugia, Italy, All right reserved.